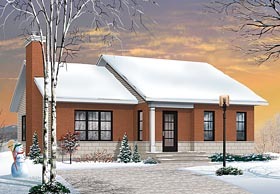 To meet the needs of clients who are looking to build a contemporary style home on a budget, the designer suggests this beautiful, contemporary/classic bungalow. 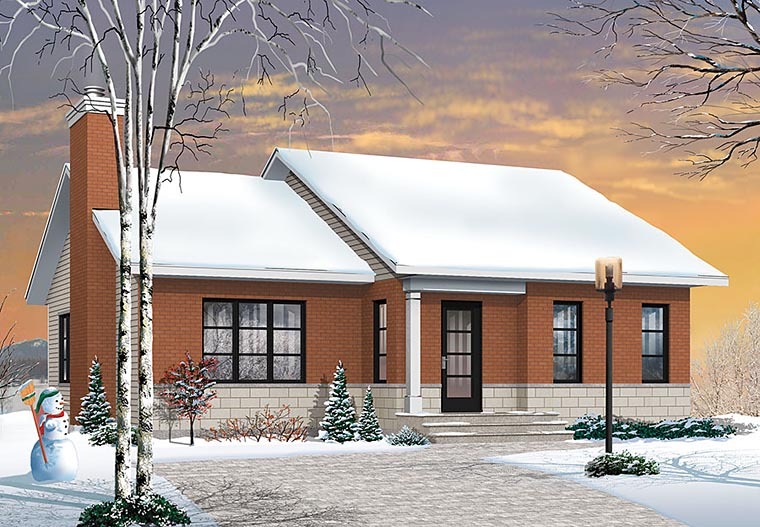 This approach favors volumes and simple lines with a classic covered porch tucked in beneath the roof slope and the attractive style of a combination of brick and aggregate. Inside, to the delight of those looking for open spaces and storage, the entrance foyer has a large closet and is conveniently located adjacent to the second bedroom, which could be used as a home office instead. The living room has a cozy fireplace and the kitchen is complete with an island for informal meals and a dining area with room for a table that comfortably seats six. The master bedroom has a walk-in closet and the well appointed, full bathroom has a large, pedestal bath and a separate, 54" x 60" shower enclosure.